You may have seen a pop-up card before, but you’ve never seen one like a LovePop. Detailed and sure to delight, when a LovePop card unfolds it’s like a mini surprise party. The designs fold flat, properly hiding the secret inside. When the unsuspecting recipient opens the card, an intricate, three-dimensional shape springs to life. Watch them smile while taking a closer look, trying to figure out how such a beautiful scene emerged from a seemingly ordinary card. Makers Wombi Rose and John Wise met in shipbuilding school, and became fascinated with Vietnamese paper folding on a trip overseas. Drawing on their engineering skills, they set out to create sophisticated paper sculptures that could fold inside a card. 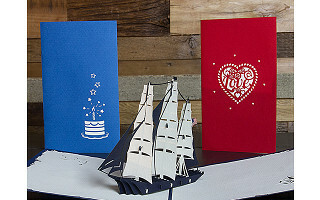 LovePop makes getting a card—whether for a wedding, birthday, anniversary, or even “just because”—memorable and meaningful. Your special someone will want to leave it on display. In fact, they may just remember their LovePop for even longer than the present. 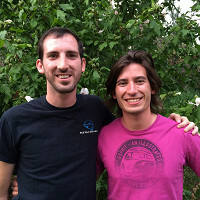 We are thrilled to meet you! We think you are powerful. You have the power to motivate, energize, and surprise those you love. We designed these cards to help you touch the lives of others in a personal, unexpected, and tangible way. 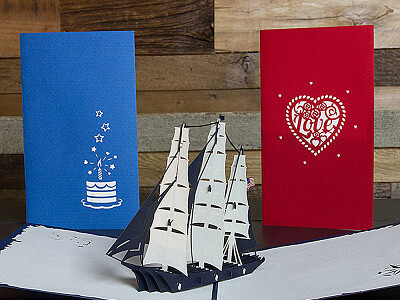 To us, nothing is more sincere than a hand-written card, especially one with a delicate LovePop paper creation. We're happy to answer any questions you may have. In NYC, these type of pop-up cards are sold all over the street for $5 each in almost the same designs. As someone interested in these, primarily due to their more intense color saturation, I wonder what else makes yours worth the higher price? Is it a different type of paper or a more personal method of cutting them? They're in beautiful colors, but I'd like to justify spending the money before I purchase! @Amy These cards are also available locally for me, $5-10 depending on the intricacy. They typically due the red, navy, and teal as their colours. Personally, I don't see how the higher price point plus having to deal with shipping and import costs would be worth it. Amy from The Grommet team here. These intricately created cards are more expensive than the kind you can purchase in the convenience store yet they're laser cut and hand crafted with superb attention to detail. As someone who's seen and admired them in person, they truly are works of art that you can give as both a card and a memento. Hi Amy, Thanks for the question! Here at LovePop we take great pride in all of our designs. There are a couple reasons why our cards are priced higher than the cards that you will find at street stands. The first is that we use only the highest quality paper with the most vibrant color palettes. The second is that we ensure that everyone in our supply chain is fairly compensated from designers to craftsmen. Unlike some sources of similar cards, we respect copyright laws and design the cards ourselves with a small design team. The values we hold in our production and especially design process do end up making our cards cost a bit more. As beautiful as these cards look, I am very disappointed that they aren't made in the US. Lynn, I completely understand your sentiment, and it is indeed a question that we pose to ourselves. On the one hand, we are very excited about the difference we are making in the community where we make them and our craftsmen are absolutely the best in the world. John spent this summer with them in Vietnam and has been helping them grow their capabilities. On the other hand, we love to do as much locally as we can. At this point, we are a very small team and have to focus primarily on the design and engineering, but as we grow, we will make very deliberate decisions about where and how we produce the cards and whom we train in the art of creating them. LovePop is about celebrating personal relationships, and finding unique ways to express our care for the special people in our lives. We truly view every part of card creation as part of what we do, and only do business with people we believe share our values. I don't see a way to buy, say, three of the same birthday cards. Is that possible? I am a bit obsessive about the cards I buy and regularly shop for them on all my travels. Until I saw the LovePop cards I believed the very best pop up cards were found in Japan, but these designs and their perfect execution raised the bar. Bottom line: These cards will raise my game for sure. @Laura - Currently, we do not offer three of the same card. Only what you see now is available - packs of three and the six. At this time, there is no intention to break this up. To Jules' point above, these cards do set a different precedent for the pop up card. In our line of work, and as consumers, it's not uncommon to see variations of products in the marketplace. We consider this a good thing. It's also what makes the whole discovery of Grommets more engaging for all of us involved. We do our best to offer our Community what we consider a high quality product with a story behind it. That's our top priority for every launch. You may have seen a pop-up card before, but you’ve never seen one like a LovePop. Detailed and sure to delight, when a LovePop card unfolds it’s like a mini surprise party. The designs fold flat, properly hiding the secret inside. When the unsuspecting recipient opens the card, an intricate, three-dimensional shape springs to life. Watch them smile while taking a closer look, trying to figure out how such a beautiful scene emerged from a seemingly ordinary card. Makers Wombi Rose and John Wise met in shipbuilding school, and became fascinated with Vietnamese paper folding on a trip overseas. Drawing on their engineering skills, they set out to create sophisticated paper sculptures that could fold inside a card.